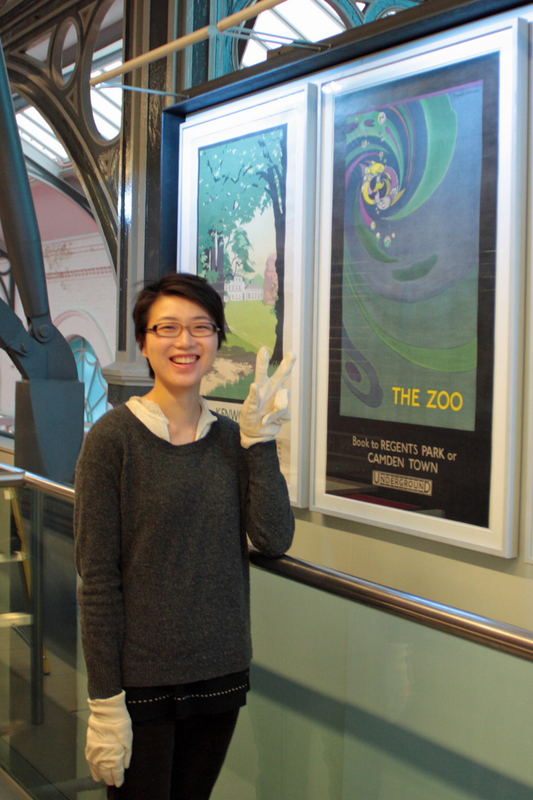 This is the final instalment in our series of Poster Parades linked to the Mind the Map exhibition, curated by the Museum’s Young Consultants and installed by our wonderful interns Siggy and San. For this display we’ve mapped London through posters. From north to south and east to west, these posters present and promote some of the fantastic places and attractions that London has to offer. 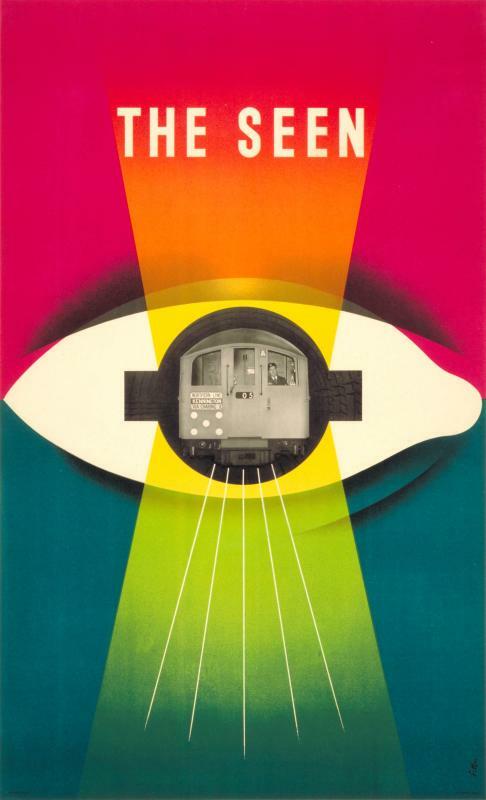 Transport posters have been used for well over 100 years, transport posters to highlight London’s leisure hotspots – from cultural landmarks and fine architecture through to fantastic open spaces. Londoners and visitors alike have been encouraged and inspired to use London’s public transport network to explore the city and beyond. Where do you like visiting most in London? Have you been to the Olympics yet? Come visit our current Poster Parade display! This display celebrates the London 2012 Olympics and Paralympics by reflecting on the history and tradition of London’s sporting life. There’s some fantastic posters on display, from football and horse riding through to athletics and swimming. 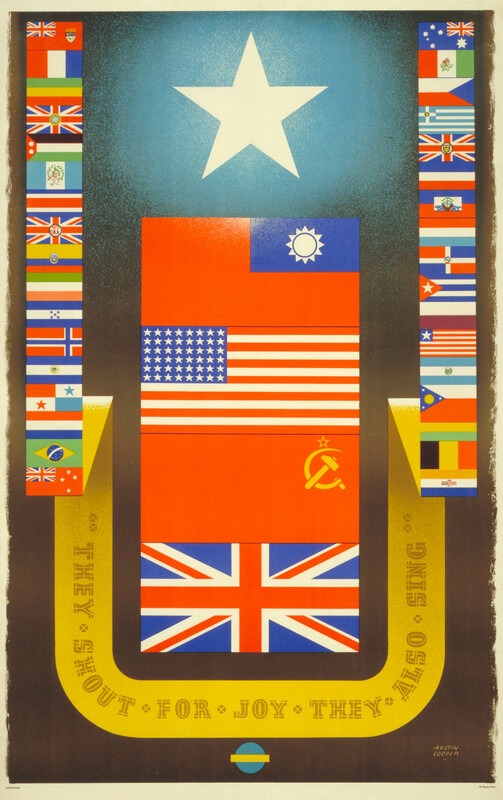 Also on display is the one poster commissioned by London Transport during the London 1948 Olympics, also known as the ‘Austerity Olympics’ during the tough economic times after World War II. 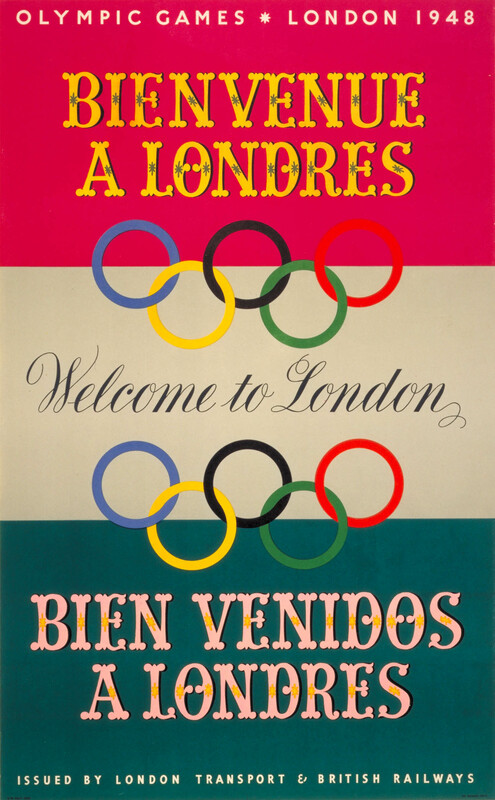 Posters have been used since the early 1900s to encourage travel to sporting events and activities. 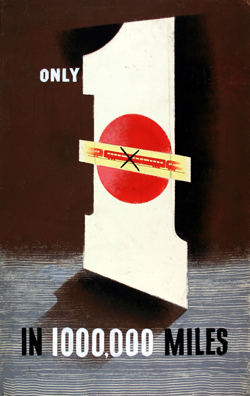 They also assisted in promoting off-peak sales on London’s public transport network, particularly as the popularity of mass spectator sports grew. Special events such as Wimbledon and cup finals bring the additional challenge of transporting thousands of extra passengers. TfL is currently facing one of its biggest challenges – informing and assisting spectators and participants in their experience of the London 2012 Olympics. 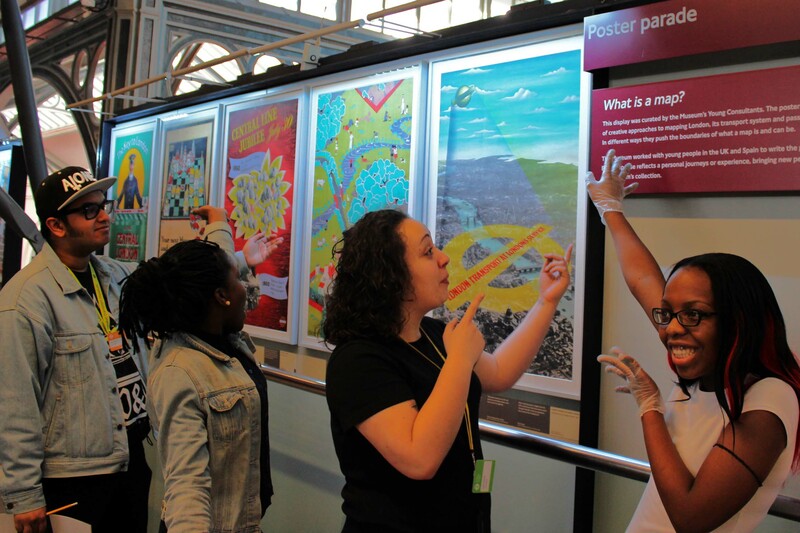 The Museum’s current poster parade display was curated and installed by our amazing Young Consultants, with input from young people in both the UK and Spain. 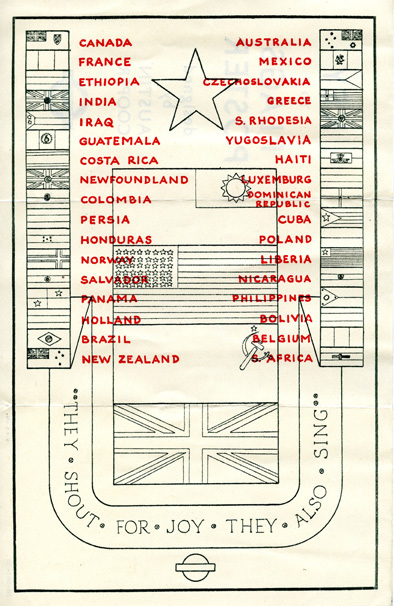 The display coincides with the Museum’s ‘Mind the Map: inspiring art, design and cartography’ exhibition. ‘Mind the Map’ features an incredible variety of maps, from those that help you get from A to B through to decorative maps, maps as publicity along with some amazing contemporary artworks that explore notions of ‘personal mapping’ and ‘journeys’. The poster display invites you to consider what a map is and can be and explores the many creative approaches to mapping London, its transport system and passengers’ journeys. This display features labels written by members of the public. We asked young people to give their personal response to the posters on display. Along with involvement from young people in London, we were also lucky enough to work with the wonderful students from the Colegio Cardenal Spinola school in Spain, whose teacher Antonio Cortés has been using the Museum’s collection as a tool to spark discussion during his English language classes. Each label features a response that reflects a personal journey or experience, bringing very new and insightful perspectives to the Museum’s collection. A big thank you to everyone who took part! On the 6th January curators and museum technical assistants spent the early morning installing the new poster parade ‘Painting by numbers’. The display shows posters which creatively adopt facts and figures to celebrate the increase of efficiency, reliability and progress of London transport operators but also offer solutions to problems faced by commuters on their journeys. Selecting the posters for display was a tough decision, and was heartbreaking to see some excluded from the final 20. 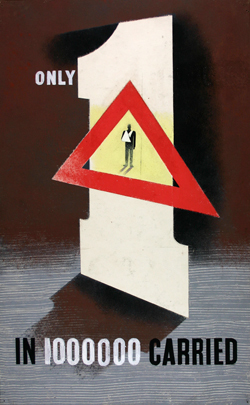 Two artworks from 1953 by Tom Eckersley (above), one of the leading poster designers, were found on our catalogue but could not be included in the exhibition as our aim is to show posters rather than rough sketches and drawings. Interestingly the design stage of the artworks didn’t go further than the drawing board, so their design was never taken forward and seen by the public on the Underground. Another poster which was unearthed on the catalogue dates back to 1912, and is by an unknown artist. It’s a nifty design which shows a bar chart comparing the speed of different modes of transport. 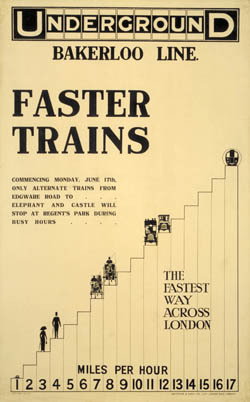 The poster promotes the use of the Tube by claiming it is the quickest and easiest way to get around London. If you look closely you’ll be able to see a snail at the bottom of the chart as one of the comparisons! For the final 20 selection come and see the display which will be up until the 22nd March 2012. London Transport Museum is currently hosting a celebratory event of the transport related work of John Burningham in its new poster parade “John Burningham: Journeys of Imagination”. 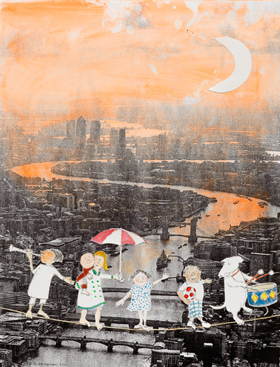 Along with his historic commissions created for London Transport and other travel companies, visitors can see an entirely new commission created by John Burningham. The poster was originally commissioned by London Transport in 1968 but was never completed because of John’s work on “Around the World in Eighty Days” … until now. 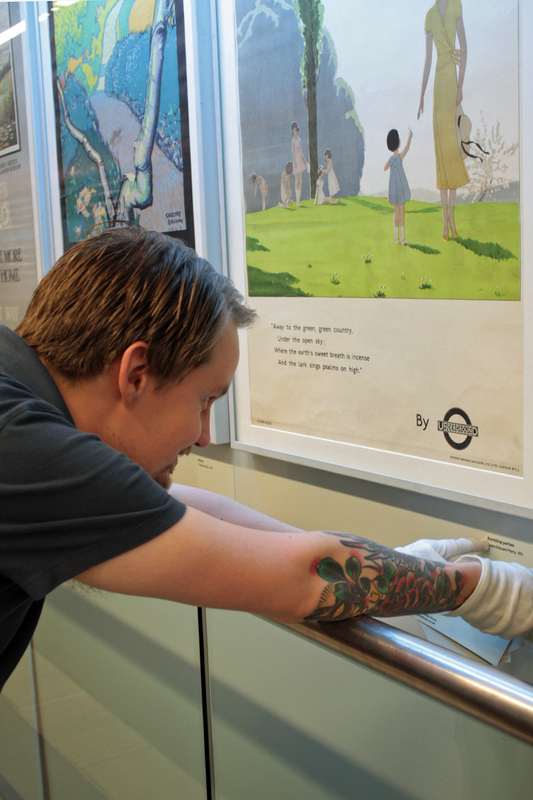 London Transport Museum re-commissioned the poster entitled “Children’s London” and a team of curators and technicians arrived at the Museum early this morning to ensure the poster was on display in time for the Museum opening at 10am. The poster which is currently on display in the Poster Parade can be seen until the exhibition closes on 1st December. Reproductions are also available for purchase in the Museum Shop. We think it was definitely worth the 40 year wait and can’t wait to hear your comments.